Happy Monday -- it's giveaway time! 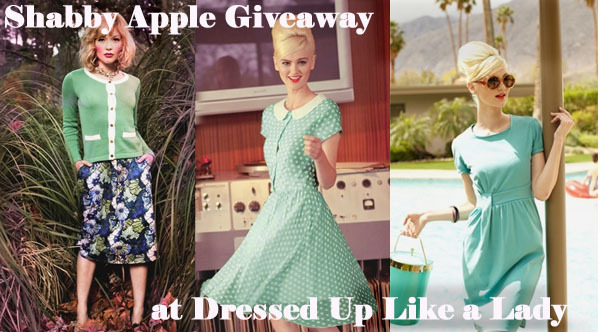 What better way to start the week than with a chance to win a free $75 gift card to Shabby Apple? We've worked with this intensely reputable online retailer before, and I LOVE their high quality, vintage inspired duds. (include an email if it doesn't link to an active blog or profile). You have until July 14th at 11:59 pm EST to enter. This giveaway is for readers with a US mailing address only. Good luck! Thanks for the giveaway opportunity! I love Shabby Apple. Liked them on FB and if I had to choose a favorite item, I'd pick the Tinsel Town skirt! http://www.shabbyapple.com/p-1296-tinsel-town-skirt.aspx All about the tulle lately! Love Shabby Apple :). I'd probably buy the Academy Awards skirt which I've been eyeing for some time. I'm going to need the Pizarro skirt. Way too fabulous not to own! Oh man... I'm going to have to own the Pizarro Skirt. I like Shabby Apple on Facebook. I love the Alice dress! Thanks for this giveaway! ...I've been loving giant stripes lately, and it's named after the town I used to work summers in. I would personally get the tinsel town skirt! I like Shabby Apple on Facebook. I love the One for my Baby Dress and the Ceilo Swimsuit. I abosolutely love their clothing, its so femimine! Just liked them on facebook, I would love the Admiral dress. Liked on FB!! And the Blue Eyes dress is absolutely adorable! I like them on facebook and I'd get the gold bangle set. I like Shabby Apple on FB. If I had to just pick one thing, I'd probably possibly choose the Blue Eyes Dress, but that could very much change if I actually won and spent even more time looking through everything. I would use it towards the 'one for my baby' dress. so cute! I like Shabby Apple on facebook and I would like the Alice dress also! So cute. Well... I've never actually been to Shabby Apples sight but I would probably put a gc toward an amazing post-baby dress. Something to inspire me to work off the baby fat. I've never been to Shabby Apple but if I were to get a gc I would put it toward an amazing dress that would inspire me to shed the baby weight next Feb. Your prices are excellent. I liked Shabby Apple on Facebook. I am a jewelry lover so my first choice would be the coral and gold bangles. Thanks for the sweepstakes. I follow ShabbyApple on FB. Really not fair you're asking me to choose one item! That being said, the Malt Shop dress is the cutest thing I've seen in a minute. Good luck, everyone. I absolutely love the Tulleries dress. I liked SA on Facebook! Thanks for the great giveaway! Hmm. . . so hard to pick just one. I think I'd order the Heart of Me dress - great vintage cut that also looks good on my shape. I would buy the baciami dress. I liked them on Facebook and I really hope I win! Man oh man! I wanna win this mess! I already like Shabby Apple on FB, and I LOVE the red queen lace dress. shewasabird at yahoo dot com. Liked Shabby Apple on facebook! I would get a few Harbor Tees--I've been looking for that classic white scoop neck/cap sleeve tshirt everywhere, this one looks just right. Liked on Facebook! I would get a few Harbor Tees--I've been looking for that classic white scoop neck/cap sleeve tshirt, and this one looks perfect. I am lusting over One For My Baby, Desert Modern, Blue Eyes, Heart of Me....I could go on!!! Oh dear I think my comment was eaten up by the internet. I wanted to say that I am excited that you turned me on to this website! I am definitely keeping an eye on them via facebook. I really just can't pick one item! I love the One For my Baby, Desert Modern, Heart of Me, and Blue eyes dress....and many more!! I love the Cecily Skirt. I've seen so many things I've wanted on Shabby Apple, but I've never taken the plunge. I am smitten with the Admiral dress! Love the nautical vibe without being too costumey or over the top! I like shabby apple on facebook and I would get the cotton candy dress! "2300 and 38 Inches" because a) it has a badass name and b) it is a take-no-nonsense kind of dress. Perfect for stalking around rainy England. I'd need some seamed stockings though. The L’OR BELLE # 11 is gorgeous and classic. I'd get the Right Stripes heels... so cute!!! I like Shabby on FB. I like Shabby Apple on facebook! I would buy the Confidential dress! I like Shabby Apple on facebook! I think I'd get the Confidential dress! I would get the Racquet Club dress. It is perfect! The Alice dress is too cute! If i would pick anything I would love to have the Uluru Dress.